Hi I’m Lonnie Muse with Innovative IDM. Would like to talk to you a little bit about why you should back up your PLC, but first I’d like to show you something. Something that’s really horrifying, something that will just kill your day at the plant. This is what we need to look at, this is something nobody noticed. Nobody noticed that PLC light going off, here’s the culprit a little bitty 40$ battery. You know what the result was? The programs got lost when they turned the power off, turned the machine back on guess what no production. Can you imagine this you’ve got a production line down because of a battery and no back up when the tech tells you there’s no back up, I don’t have the programs, we don’t know where they’re at, can’t find them. How long do you think that’ll be down? Now the first big issue is being prepared for that. This is a 40$ resolution, make sure to keep the PLC on so you don’t lose it when you change this. The next thing is to back up your programs in the PLC there’s a couple ways to do that. One is a little SanDisk that will fit in a PLC normally, the other is something like a CD or your server or a laptop. If you have the back up along with the software to put it in and out of your machine then the battery’s not such a big deal because you can recover. But if you don’t have this recovery is a lot of money and a lot of time because now you’ve got to recreate everything from scratch and that’s thousands, maybe 10 thousands of dollars. So you get a choice here, 40, or 10 thousand, a few minutes a few cents, or 10 thousand, you pick. Hi, I’m Jeff Rogers with Innovative-IDM. One of the biggest challenges facing today’s automation specialists is the way to make multiple fieldbuses communicate with upstream and downstream equipment. It’s a very daunting task that could take a lot of programming knowledge that could probably be covered in several college courses. Today we are going to keep it pretty high level and talk about a few components that could be used should you find yourself having to do this. The first thing is the type of fieldbus. There are all different kinds of fieldbuses out there. Some are proprietary, some are open-source, meaning anyone could use that type of protocol whenever designing a piece of equipment. So obviously, the ones that are proprietary are going to be harder to make communicate with other pieces of equipment, because the gateway type equipment that can be used are somewhat limited. There’s just not that many of them out there. Other fieldbuses for instance, probably one of the most well-known is Ethernet, be it internet IP, Ethernet EPCIP is very widely used standard that I see getting more and more popular every day. It seems to be becoming the standard if people have a choice. So remember proprietary is going to be a bigger challenge, but there are ways of getting around that. What you have to consider is not only the protocol that you need to make it communicate with other protocols but also the transmission media. You can actually transmit profibus protocol over an Ethernet cord, over a cat 5 cord with RJ45 connectors on it. So you have to remember just because the cord looks the same doesn’t mean that the protocol is going to be the same. So remember those things. Ideally I always tell people if it is a new piece of equipment and you want to make sure it is going to communicate with all your other equipment you really need to get with that OEM and almost demand that they use a network you are familiar with so you don’t have to go through that hassle because it’s not fun, it’s kind of a pain. Ideally use should try to standardize on a type of protocol that you are familiar with that’s flexible, gives you many different options and a lot of manufacturers support, such as Ethernet. I would say that is probably the most common in today’s market. Now if you do find yourself, for instance if you have older equipment in your plant that already has a different protocol on it and you want it to be able to communicate with say your Skada setup, or just for some sort of monitoring device or an add on or anything like that to the machine and those two protocols need to be able to talk to each other, then you could setup what is called a gateway. There are different devices that can be used as a gateway which is just allowing two protocols to communicate with each other. Manufacturers out there that make simple discrete adapter components. You plug on piece of equipment in one and another on the other end and it allows the equipment to communicate with each other through an internal circuit board. They are limited and can be pricey, the manufacturers of them are pretty proud of them. If you have a lot of components where you need to be able to make a bunch of different components talk to each other that could get sort of pricey. They can be programmed for making different types of communication protocols talk to each other. For instance, WAGO has an IO system that is known as fieldbus independent. They have fieldbus couplers that support all of the open protocols that exist in today’s market. For instance, this one right here supports Ethernet. If I wanted to make Ethernet talk to Modbus then I could drop a Modbus card in right here and have those two components talk to each other. For instance, if I had a touchscreen that only communicated via Modbus and I wanted to make it talk to a piece of equipment, say a variable frequency drive that communicated over Ethernet I could use this component as the go between. Often time people use touchscreen HMIs themselves as the gateway. This particular touchscreen has both Modbus capabilities as well as Ethernet built in to it. You could plug one piece of equipment in one port and a different piece of equipment that might be a different protocol into the other port and make them communicate via this device essentially turning it into a gateway. It can get pretty complicated. There is a lot of ins and outs as far as needing to know how to program those things, addressing registers properly with in a program to make all those talk. That’s something we have a lot of experience with because it does come up. it will only become even more important as time goes on because the top brass at all the plants and manufacturing companies around the world are always going to want better access to information, efficiency data, also remote control and data acquisition capabilities. All of that has to be done through networking all these pieces of equipment together. If you need any help with that please contact us. We have programming specialists, application specialists that can come out and help you with that. You can also find information located on our website in our knowledge center. Just go to innovativeidm.com and you will find our knowledge center there. It has white papers, for the specific products we support, on how to set them up. After all we are Home of the Legendary Customer Experience. Join us in Oklahoma City for our last Omron PLC training class of 2013. Seats are already filling up – reserve your seat today! Two classes to choose from! Yesterday at our DFW training room, we completed yet another two-day OMRON PLC training class for customers looking to increase their working knowledge. (The HOUSTON class is next week. Sorry, sold out.) We had enough PLC brain power in the room to teach an engineering class. k of the room. And to top gun it off, we had OMRON’s Ed Allen giving a cursory view of the Omron NJ controller hooked up to a whackosick demo that is in for all purposes a mini-factory production line. Really a cool two days for the people who attended. Plus, everyone got to take home their PLC and power supply — came with the cost of the class. Upcoming classes in Tulsa and Memphis. Check our training website for all of our training dates. 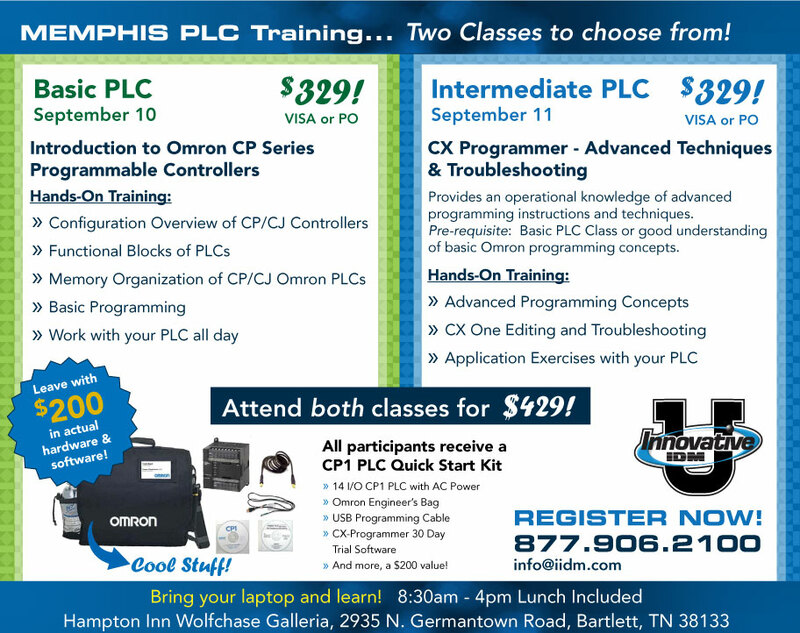 Omron Basic and Intermediate PLC training classes are coming to Memphis on September 10 & 11. Only 12 seats available for these popular classes – reserve your seat today! For a current schedule of our training classes, check out www.innovativeidm.com/training anytime. To reserve your seats for the Omron Basic and Intermediate PLC training in Memphis, give us a call at 877.906.2100 or send us an email at marketing@iidm.com. Omron Basic and Intermediate PLC training is coming back to Houston on August 20 & 21 – these classes sold out in one day when we offered it earlier this year. Only 12 seats available – reserve yours today! Check out our current training class schedule at www.innovativeidm.com/training anytime. To reserve your seats for the Omron Basic and Intermediate PLC training in Houston, give us a call at 877.906.2100 or send us an email at marketing@iidm.com. Our popular Omron Basic and Intermediate PLC training classes are coming back to Dallas / Fort Worth on August 13 & 14. Classes are limited to 12, and seats will fill up fast. To see our current product training schedule, check out www.innovativeidm.com/training anytime! Sign up for Omron PLC training in DFW today – just give us a call at 877.906.2100 or send us an email at marketing@iidm.com.